It’s a Race! 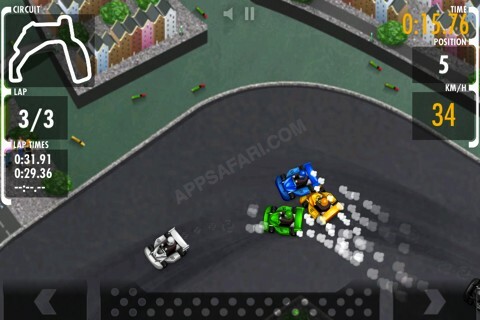 Red Bull Kart Fighter World Tour is a slick little racing game for the iPhone and iPod touch from Red Bull GmbH. You’ve seen apps like this before, but this review will focus on what sets Kart Fighter apart from similar race car titles for iOS. Red Bull Kart Fighter World Tour uses your basic 2D top down racing template. You are a contestant in race with several other opponents. The game has funny theme tracks you can download and various add-ons. Since its free to try, you can decide if you want to pay for any of the add-ons once you’re familiar with the style of play. Controls in Red Bull Kart Fighter World Tour are a little different than you might expect from many iPhone app and iPod touch titles. I was expecting either on-screen pad controls or accelerometer controls. There are actually two different control themes to choose from. The automatic mode in Kart Fighter simply puts you in charge of speed. Your car follows a pre-determined path through the level. If you go too fast around turns, you will bump into things are take damage. I think this mode is great for little kids who might not have the dexterity to steer manually. The manual setup gives you controls to go forward, backwards and turn left of right. Once you get oriented, these controls work fairly well. You’ll have to get a feel for how fast you can take turns. After that, you should have no trouble keeping up with most of your opponents. The sound and music in Red Bull Kart Fighter are fairly standard. Your normal engine sounds and tire screeches greet you at the appropriate moments. The music selection features exciting, upbeat, electronic tunes with strong beats. They get you into the mood for a driving application. Additionally, you can also import a playlist and listen to your own tunes while racing. The graphics are colorful and cartoony. I like the entire atmosphere of this title. It’s rather upbeat and cheerful. Some of the tracks have funny themes for their locale and offer a little more than your standard racetrack scenery. Even when the race track is full of lots of miniature cars, things run smoothly and look great. Red Bull Kart Fighter World Tour is a great little title for those who like driving games. Although the controls are a little odd, it is still worth trying out since it is free. I do have to report that the application crashed on me one time. I’d say fans of racing titles should definitely give this little app a try. 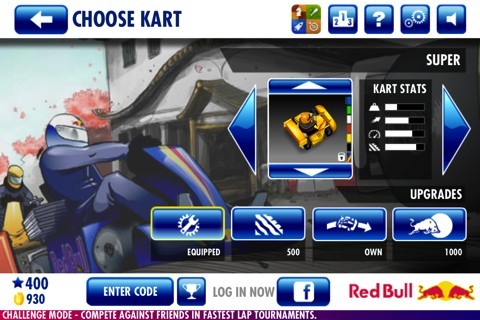 AppSafari review of Red Bull Kart Fighter World Tour was written by Joe Seifi on April 2nd, 2012 and categorized under App Store, Arcade, Games, iPad apps, Racing, Universal. Page viewed 4137 times, 1 so far today. Need help on using these apps? Please read the Help Page.